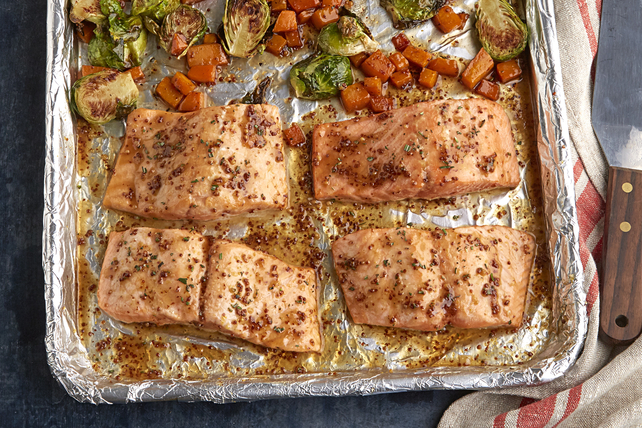 One-pan recipes are always a hit, so we're pretty sure this One-Pan Roasted Salmon & Squash recipe is sure to become a weeknight favourite. Brussels sprouts, squash and salmon fillets - all in one pan! Mix dressing, syrup, mustard and rosemary until blended. Combine vegetables in medium bowl. Add 3 Tbsp. dressing mixture; mix lightly. Spread onto foil-covered rimmed baking sheet sprayed with cooking spray. Bake 15 to 20 min. or until vegetables are softened. Remove from oven. Use spoon to move vegetables to one side of baking sheet. Add fish to other side of pan; brush with remaining dressing mixture. Bake 15 to 17 min. or until vegetables are tender and fish flakes easily with fork. Prepare using 1 tsp. dried rosemary leaves.